Our Interwoven Lives with the Zapotec Weavers is beautiful memoir of lives and families from completely different cultures that have intertwined and enriched each other for several decades. The differences and parallels are eloquently expressed by author, Susanna Starr, and photographer, John Lamkin. Susanna writes about her life as an artist and gallery owner in Taos, New Mexico, but she primarily focuses on her deep connections with Zapotec weavers in the small village of Teotitlan del Valle located about 20 miles from the city of Oaxaca in the foothills of the Sierra Juarez mountains in Mexico. 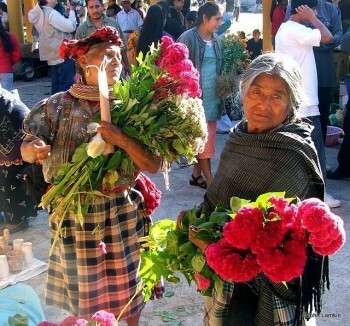 The Zapotec people are the descendants of an ancient civilization that is indigenous to the Oaxaca region. In this remote village, many generations of families have been producing intricately designed, hand-woven rugs that are unique to their creators and their locale. Their materials come from the world they live in with wool produced by local sheep and yarn made locally with dyed, vivid pigments. Each rug is a work of art, reflecting both traditional and more modern, innovative designs. After navigating mountainous dirt roads to find this village in the 1970s, Susanna Starr was so entranced with the weaving community she found that she kept going back and even established her own second home in the area. 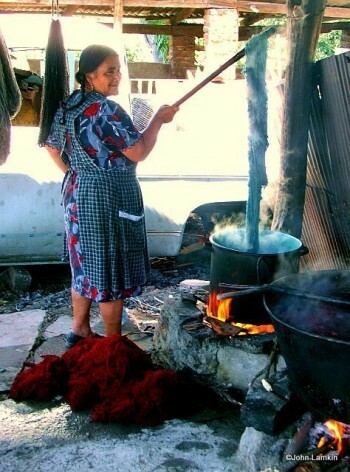 She developed a mutually beneficial business relationship with the Zapotec weavers, purchasing their rugs and taking them back to Taos to sell in her shop. But her relationship with the weavers became much more than business. Susanna shared in their lives as their families grew and adapted to changing times. The book is roughly divided into her relationships with three generations of weavers—the parents (now grandparents) who are about Susanna’s age, their children who gradually took over the weaving business from their parents, and now the grandchildren, some of whom are becoming talented weavers themselves and others who are spreading their wings as they pursue education and careers. But the beauty of this story is the closeness of these families, because wherever these children go they retain the cultural values and traditions of their community. 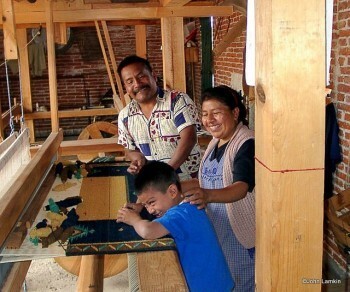 In spirit and soul, they will always be part of their Zapotec village. Throughout the book, Susanna discusses her own family and the differences and similarities she sees as her children, like the Zapotec children, grow and move into adulthood. In many ways, this is a travel book because the reader is transported to a small Mexican village and soon feels immersed in this warm and colorful community. It is a book about place, family, culture, traditions, and hope for the future. We are introduced to multiple generations in several families and we finish the book feeling as if we know them and would love to meet them too. John Lamkin’s colorful, perceptive photos bring Susanna’s stories visually alive. We are able to not only see the beautiful rugs but to study the fascinating faces of the weavers and their families as they grow up and grow older, celebrating both daily life and the many traditional festivals that are so much a part of their culture. This book can be purchased for approximately $20 in paperback or $30 hardbound from Amazon or ordered from Cynthia at Paloma Blanca Press (PalomaBlanca.Cynthia@gmail.com). It is also available through your local bookstores or any other online bookstores. Susanna Starr is an entrepreneur, photographer, speaker, artist, and owner of Starr Interiors in Taos. She is also owner, designer and director of the acclaimed designer weaving collection, “Line of the Spirit,” whose founding and development is described in her book. Susanna’s articles have appeared in many publications and she is a member of the International Food, Wine & Travel Writers Association. Her website is www.SusannaStarr.com. John Lamkin is an award-winning journalist and photographer who is also based in Taos. He is a contributing writer and photographer for many publications and a board member of the International Food, Wine & Travel Writers Association. His website is www.TravelWritingAndPhotography.com.